When Barry’s first season ended last May, a common refrain from critics was that it functioned perfectly well as a series finale. Barry’s decision to kill Janice out of self-preservation scanned as proof that he’ll never break free from a vicious cycle of violence. No matter how much he tries to escape his past life by diving into the Los Angeles theater scene, his true calling will always be lurking around the corner. Faced with the opportunity to pay for his crimes, he immediately fell back on old habits because the reckoning would be too much to bear. Despite his guilt and depression, and Fuches’ emotional manipulation, Barry always had a choice, and he chose death almost every time. What else is there left to say after, “Starting…now”? "The Show Must Go On, Probably?" Luckily, my skepticism evaporated almost immediately after watching tonight’s cold open. Written by Berg and Hader, and directed by Hiro Murai, “The Show Must Go On, Probably?” opens with Fuches’ replacement hitman (Shaughn Buchholz) botching a job so badly that it ends with him getting shot, the client who hired him committing suicide, and Fuches’ arrest at the hands of the Cleveland police. Every element in the sequence is fully realized: the Coen-esque tone that mines comedy and tragedy from human failure; the deliberate pacing, designed to reveal a new wrinkle after every single beat; Murai’s tight framing that concisely communicates all necessary information; a cheeky sound design that filters danger through the mundane; the hilarious spare details, like how the two targets were watching While You Were Sleeping before their untimely deaths. It’s a pitch-perfect introduction to the season, partially because it features some of the series’ best writing and direction right out of the gate, and also because this silly catastrophe ends up indirectly leading the LAPD back to Barry’s doorstep yet again. Back in L.A., Barry has channeled all of his remorse into a sure-to-be-mediocre production of The Front Page, completely oblivious of the emotional tumult that surrounds him. The rest of the class has no interest in following through with the show because of Gene’s grief-driven nervous breakdown. Detective Loach and his new partner May (Sarah Burns) inform Gene that the LAPD will no longer actively pursue the investigation into Moss’ death, believing it to be a cut-and-dry retaliation from the Chechen mob. No one has any interest in acting right now, except for Barry, who uses the stage as therapy and a diversion. “If we cancel the show, then what was the point?” he mutters to himself, which is the closest he’s come to acknowledging that Moss’ death has to mean something. 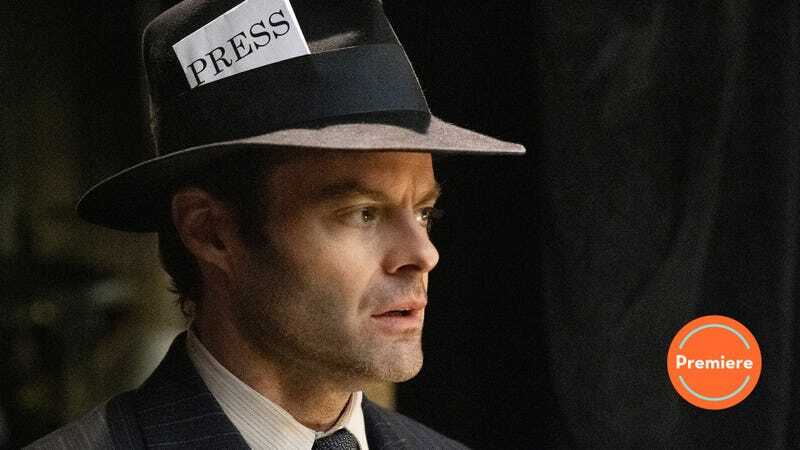 In Barry, Hader and Berg convey a double-edged perspective towards acting. On the one hand, they’re necessarily cynical about its intersection with Hollywood and careerism. The actors in Gene’s class, while sweet and generally well meaning, aren’t bound to improve their craft because their narcissistic ambition hinders self-reflection. They ham it up every time on stage because they believe that will make them stand out, and Gene has a financial interest in feeding their delusions. On the other hand, Barry represents an actor’s ideal. He’s someone who has no interest in fame or success. He simply views drama as a vehicle for emotional truth, a way to access feelings that would otherwise be bottled up. But Barry can’t accomplish that unless he’s honest with himself, which proves to be as difficult as it’s ever been. When Gene threatens to cancel the class because he’s too distraught, Barry convinces him to keep going by telling the story of the first time he killed someone. Outside of Sangin in Afghanistan, Barry was perched in a sniper’s nest with his buddy Albert. They see some “suspicious activity” 700 yards away. Barry asks Albert if they should radio their Lieutenant, but Albert, believing that Barry will likely miss anyway, tells him just to take the shot anyway. Only Barry doesn’t miss. He kills him on his first try. As he’s telling the story, Gene asks Nick and Sasha to act out the tale on stage. Nick and Sasha’s version has all the hallmarks of clumsy amateur theater—the overwrought performances, the over-emphatic gestures, the cheesy audio accompaniment, etc. But Barry shuts down when Nick, playing Barry, collapses into histrionics at the mere idea of taking a life. In the real story, Barry didn’t just kill one guy. He also shot two others who were checking on their friend. There were no sobs. There were cheers and chants. Barry gained the respect of his entire platoon for killing three “sheep fuckers” from 700 yards away. It was a moment of pride. When Gene asks if Nick and Sasha’s version was accurate, Barry lies and says that it was. A small price to pay for the show to go on. Yet, visions of war aren’t the only things clouding Barry’s mind. NoHo Hank reenters Barry’s life in order to get him to kill Esther (Patricia Fa’asua), the head of the Burmese crime family. 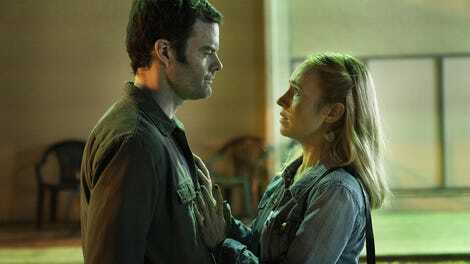 Jealous of Esther’s relationship with his Bolivian crime partner/friend Cristobal (Michael Irby), Hank wants her out of the picture anyway, but when Goran’s family threatens to kill Hank for teaming up with the people who ostensibly murdered their son, he sees an opportunity to pin the crime on Cristobal’s new friend. He doesn’t want to see Barry get killed, but he needs him to step up and finish the job. As Hank thrusts Barry back into the Los Angeles underground, the LAPD receives a DNA sample from Cleveland, Ohio that matches a tooth found at the scene of Goran’s murder. It takes a minute for Loach to put together the connection between Fuches and Barry and a whole other minute to match Barry’s physique with the blurry dashboard camera image. Loach may be a sad sack, but he’s also a lifer detective. He’s not going to allow a partner’s death to go unanswered. “We don’t know what happened. Nobody actually knows what happened,” Gene explains to the cops as Murai’s camera lingers on Barry’s stony expression. With the LAPD on his trail and Hank breathing down his neck, it’s only a matter of time before Barry has to make another disastrous choice in order to stay alive. Because, at the end of the day, he knows what happened. He knows what has to be done. All Barry wants is a new life. His old life has a different idea. Welcome back to Barry reviews at The A.V. Club! I’ve seen the first three episodes of the new season and they are quite strong. It should be a fun ride. New fun facts about Gene: He once roomed with Rip Torn, who gave him a gun from the 1984 film Flashpoint. I love the recurring joke about Gene’s cheapness. When he cancels the show, he refuses to offer the crowd refunds. Instead, he offers vouchers for his book or other merchandise at the box office. The episode closes with Link Wray’s “La De Da” from his self-titled 1971 album. Listen to it below.